At the thanksgiving party for her double victory as Best Supporting Actress for Rainbow’s Sunset at the 2018 Metro Manila Film Festival and Gawad Pasado Awards 2019, actress Aiko Melendez announced that she’s taking a short break from showbiz. 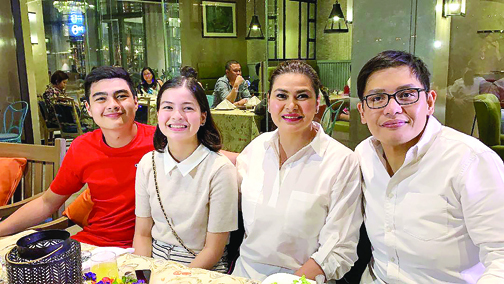 Aiko Melendez was joined by her partner Mayor Jay Khonghun and children Andre Yllana and Marthena Jickain during a thanksgiving party held Sunday evening at Chateau 1771 in BGC. Talking to some select members of the entertainment press in BGC on Sunday, the multi-awarded actress said that she is going to help her partner Subic Mayor Jay Khonghun, who is eyeing the vice gubernatorial position in the province of Zambales. She also took the opportunity to apologize to ABS-CBN because she had to decline a role in the upcoming series Sandugo. “I was supposed to do a teleserye with them. I think you’ve already seen the publicity shoot. I was there, but unfortunately, I’m not going to be part of that series anymore. I had to decline. Pasensya na po. And babawi po ako sa inyo. Mas kailangan lang kasi talaga ako ngayon ni Jay,” Aiko appealed. The role she’s supposed to play was given to Vina Morales, to which the 43-year-old actress was happy about. “I told her to accept the project when she informed me that the role was being offered to her. She’s my friend and I’m happy na napunta sa kanya yung role,” she said. She also opened up about her fears that something bad might happen to her and her politician boyfriend after the latter was included in the president’s “narco list”—an accusation both of them have denied. “We are glad that instead of losing support, more people are showing their love for Jay, more people are expressing their support in his bid for a higher position. It’s just sad na ma-accuseyung taong mahal mo ng isang bagay na alam mong hindi totoo. Masama man pakinggan pero for him to be tagged as one of the narco politicians na drug lord, that’s something so unfair,” was her brave statement. “Kasi, if there’s one person who knows Jay very well, that should be me. And I’ve seen how he works. I didn’t see anything illegal. I didn’t see or hear him doing anything suspicious. Even his drivers, his staff, who have been working for him for 15 to 20 years can attest to that. And sila mismo ang nagba-vouch sa credibility ni Jay,” she continued. Meanwhile, Aiko also clarified that the photos she posted on social media were not from a prenup shoot. She said that the photos were meant for a calendar that they plan to give out in Zambales. “I’m not engaged yet. I don’t have a ring. I don’t have a proposal yet or something, not na nagpaparinig ako,” Aiko beamed.